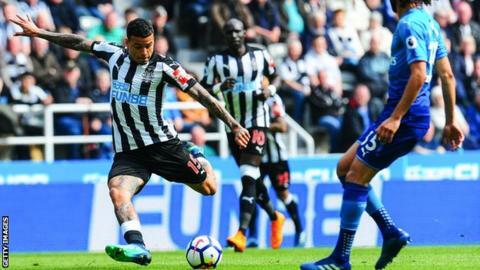 Chelsea winger Kenedy has returned to Newcastle on a season-long loan following a successful spell at the club last season. The 22-year-old Brazilian joined Rafael Benitez's side on loan in January and scored twice in 13 games. Kenedy moved to Chelsea from Fluminense in 2015 and has made 27 appearances for the Blues. "I am so happy with this interest from Rafa Benitez, that he came back for me," he said. "I want to keep it going, the work that I did here before, for the new season." Kenedy becomes Newcastle's third addition of the summer following the signings of Slovakia goalkeeper Martin Dubravka and South Korea midfielder Ki Sung-yueng.